Winter is not always everyone's favorite season. But in Utah, winter is eagerly anticipated with its opportunities for skiing, sledding, and ice skating. Something that is a marvelous winter experience is taking an old-fashioned winter sleigh ride. What could be more romantic than riding through the snow in a horse-drawn sleigh? Here's a list of Utah companies that offer winter sleigh rides. Call ahead for reservations and always dress warmly. 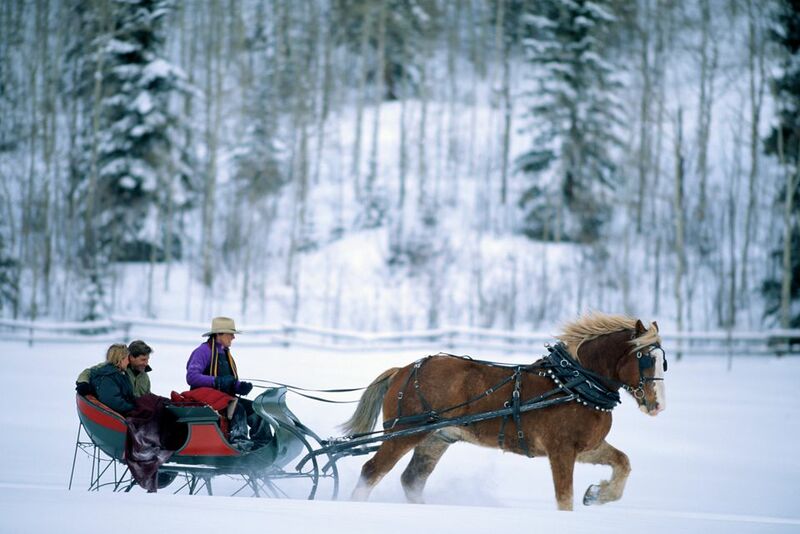 Boulder Mountain Ranch offers sleigh rides at Deer Valley. Its one-horse open sleigh can accommodate up to six people and is a prime opportunity for memorable marriage proposals, snuggly newlyweds, or a small group of friends or family. Private sleigh rides for just your party start at $125. Boulder Mountain Ranch also has a two-horse sleigh for larger groups. Rides leave from Deer Valley Resort. The ride will wind you through the snowy trails of the Deer Valley Resort. The sleigh rides run seven nights a week by reservation only. After your sleigh ride, you can warm up with dinner at one of the restaurants in the area. All Seasons Adventures offers sleigh rides and dog-sled adventures near Park City. Go on an old-fashioned sleigh ride pulled by two horses through a private ranch at night and check out the stars above, undimmed by ambient light, as you glide along the snow. Private sleigh rides are available by reservation every day of the week. The cost is $39 per person, with a $100 minimum. Hot beverages will be provided. Dinner sleigh rides are offered on February 17, 19, and 21, 2019. Private dinner sleigh rides available for groups of 15 or more. Guests can expect a festive setting, authentic sleigh ride, home-cooked dutch oven meal, cowboy poetry, and live music. The company offers transportation to and from Park City for a fee. Canyons Village Resort in Park City is only a short drive from the Salt Lake City airport and it offers scenic sleigh rides through Park City Sleigh Rides several days a week during the winter, with extended days during the holidays, as conditions allow. The horse-drawn private and group sleigh rides take you through a lovely, scenic, and snowy area from Canyons Resort through Willow Draw. During this 25-minute ride, they provide you with blankets for your comfort. Dress warmly ​in gloves, a hat, and a warm jacket to ensure you remain comfortable. Book in advance. You'll see elk on sleigh rides at Hardware Ranch Elk Refuge in Blacksmith Fork Canyon in northern Utah, about a two-hour drive from Salt Lake City. The state of Utah established the Hardware Ranch Wildlife Management Area as a location to operate a winter feeding program for Rocky Mountain Elk. The 2018–2019 elk-viewing season at Hardware Ranch runs from December 7, 2018, until February 10, 2019. When there is less snow on the ground, they use wagon wheels. When there is at least a foot of snow on the ground, they switch out the wagon wheels for sleigh runners. The vehicle used is the same regardless of whether it has wheels or runners and carries 20 to 25 people. Tickets are available on a first-come, first served basis at the Visitors Center. The sleigh rides come with homemade cookies and complimentary hot drinks. Warm homemade blankets will keep you and your family nice and warm. North Forty Escapes, on a ranch about 20 minutes from Park City, offers winter tours by horse-drawn sleigh, dog sled, or snowmobile. You can enjoy a sleigh ride along their private stretch of the beautiful Weber River. The private ranch offers some of the most pristine and beautiful views of the majestic Uinta Mountains. They offer a sleigh ride and dinner. The cost is $99 for adults and $79 for children. Rocky Mountain Outfitters runs horse-drawn buggy and sleigh rides around the Homestead Resort, in the beautiful Heber Valley outside the small town of Midway, about 20 minutes from Park City. They use beautiful teams of Clydesdales, Belgians, and spotted draft horses. Prices vary; only your group will be on the sleigh. The sleigh ride can be combined in a package with dining or lodging at the resort. USA Today calls Rocky Mountain Sleigh Company one of the top 10 sleigh/dinner operators in the United States. Sleigh rides take place at Stillman Ranch along the Weber River outside Park City. Rides include an optional homestyle dinner served in the ranch house by the fireplace, a cozy end to this wintertime experience. At the Snowed Inn Sleigh Company at Park City Mountain Resort, you'll ride up the slopes in a horse-drawn sleigh to the lodge, where you'll have dinner accompanied by live music. Sleigh rides are offered with or without dinner every night during the winter. Children's, vegetarian and gluten-free menu options are available with advance notice. The evening ends with a relaxing sleigh ride back to the resort. The price for the sleigh ride and dinner is adults $100, children $65, with children 2 and under complimentary. The sleigh ride only is $20 per person. The Viking Yurt at Park City Mountain Resort has been described as one of the most unique, romantic, and exquisite winter experiences in the country. Enjoy a Snowcat-drawn sleigh ride up the slopes of the resort to the cozy Viking yurt (hut), amid a deep pine forest, where a four-hour gourmet dinner is served. There is just one seating, with up to 40 guests. You'll have incredible views of the night sky, giant trees, and the best views of Park City and the surrounding mountains.